In the process of trying to identify a cloth doll from the late 1980s, I ran across this brief history of Ada Lum. Ada Lum (b. Australia ~1907[?]-d. Hong Kong 1988), sister of the tennis champion Gordon Lum, appears in references to both her brother and in accounts of the actress Anna May Wong and the humanitarian French Jesuit Priest Father Jacquinot de Besange. 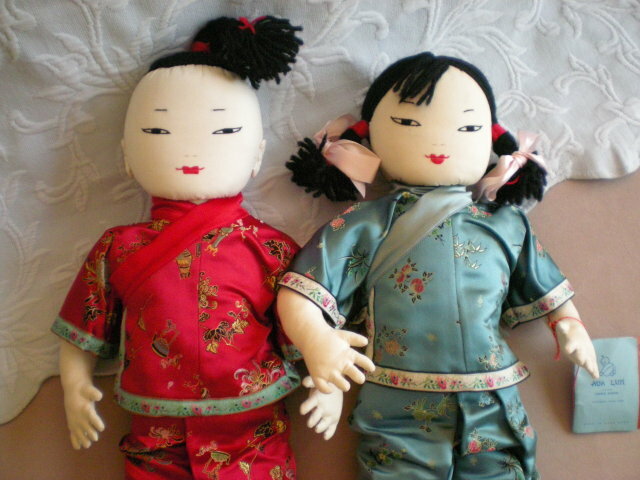 More people recognize Ms. Lum’s cloth dolls than her name, though. (See examples from asiawee.blogspot.com above.) Cloth doll collectors who own her dolls may not have much more to go on than the “Made in Hong Kong” stamp on the doll or its clothing. The story behind how Ada Lum began her doll, housewares, fashion, and interior design company is well worth reading. I recommend checking out more of her amazing story at http://asiawee.blogspot.com/.